Barça's U14 and U12 sides are champions of Catalunya! The U14 and U12 teams are champions of Catalunya having won their respective finals in Martorell. Juan Carlos Hidalgo’s players beat Sant Gabriel 6-2 and Pablo Álvarez’s team won 5-3 against Espanyol. The big final started to go Barça’s way after just four seconds when Laura Mas Berenguer made the most of some tentative defending to score the opener (1-0). From then on, Barça were on top but they were unable to create many clear-cut chances. On a very hot afternoon, the rhythm of the match was slow and it wasn’t until the third quarter that the match was decided with a 4-0 score line. However, Sant Gabriel didn’t give up and they responded with two goals but in the end Barça were too strong and they ran out 6-2 winners. 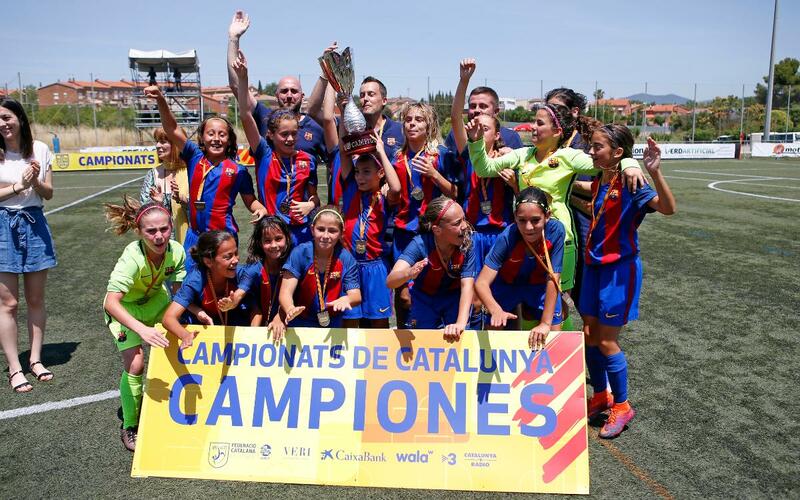 Laura Mas Berenguer (2), Berta Gras, Alicia Infante, Valeria Trujillo and Natalia Muñoz got the goals and they finished off the season in style by adding the Copa Catalunya to their league title. This was an absolute classic of a game which lived up to its status as a Barcelona derby. Espanyol were physically stronger than the blaugranas but the later were able to overcome this through two great goals from Aina Roman and another from a quick move finished by Laia Martret in the third quarter. They showed real intensity and the nerves were jangling. Then Xenia Puigcercós and Maria Calderón secured victory in the final with two late goals.